Communication is seamless, because interpreting occurs during speaking. To illustrate, blue and orange are communicating through an interpreter. The interpreter continually interprets whoever is speaking at that moment, so blue and orange can feel free to communicate as they normally would in an uninterpreted environment. Things happen differently for Consecutive Interpretation. 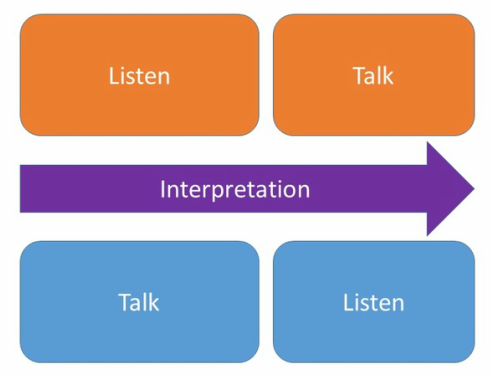 Fluid and natural communication: Because interpretation occurs 'in-action', you are able to speak and listen much as you can in an uninterpreted communication environment. Cost: This mode of interpretation is obviously very taxing on the interpreter, so a team (normally two) interpreters is required. Also, special equipment is required which can add significant costs.